Marine Navigation | Multi-touch solution for spherical display. Globus (Erdkugel) is the multi-touch domed (sphere) screen. The route calculation service is intended for calculation of a sea route from A to B preventing crossing land areas and shoals. The software receives from external application geographical coordinates of start and end points of the route and returns set of coordinates (Latitude and longitude) of the calculated route. As an additional task the service can receive navigational data provided by Raytheon bridge navigational system NCS ECDIS as NMEA sentences and send out the data via web protocol. This software help you to find the quickest or safest route on your next trip. It is automatic routing software with GPS features as well as a useful set of Marine navigation features. Via internet connection is it easy to track your boats position on the Google or Bing Maps. It is ideal for friends and family to keep in touch. · course optimization or routing. This software help to find the quickest or safest route on your next trip. It is automatic routing software with GPS features as well as a useful set of Marine navigation features. “Course optimization optimizes the course of the vessel along the great circle route. Alternately, for short legs, optimization can be calculated using the vessel’s rhumb line: The resulting course will most probably be significantly different than the great circle route”. The route calculation service is installed on Windows computer running under Win32 or Win64 and works as a web service that receives and sends data from and to main application via http protocol. The route calculation service does not have user interface and all the calculations are made and operated from the main application. The route calculation service consists of the following software modules Static 3D bathymetric data model built from vector navigational charts. The bathymetric data model takes into account spot soundings; depth contours (isobaths); land areas, intertidal areas and shoals. The initial data used by the bathymetric model were digitized from marine paper nautical charts issued by national hydrographic offices. The only marine charts suitable for coastal or deep sea navigation are used in the bathymetric model. Marine chart scale can vary from 1:5000 for harbor and berthing charts to 1:5,000,000 for open sea areas. The following pictures provide examples of bathymetric data depicted on the large scale harbor chart and small scale open sea chart. • Software algorithm for defining No Go area based on the bathymetric model. The algorithms takes into account predefined safety depth based on a vessel draft and calculates areas not suitable for navigation – land areas and shoals with a depth less than the predefined safety depth. • Software algorithm for creation of safe navigational route from A to B passing around calculated No Go areas. The algorithm firstly adds additional waypoints to pass around the No Go areas and then optimizes the resulted route in a way to make it shorter and remove unnecessary waypoints provided all of the route legs are lying within safe water. • Web service that receives data from external applications – route start and end points and navigational data from bridge system, sends the data for procession by the aforementioned software algorithms and provides results of calculations back to the external application. The service also calculates and returns distance to the final point and arrival time taking into account vessel speed provided by the external application. To minimize time required for different types of calculations, the route creation software process different types of calls separately. The following operations will be performed depending on request (call) received from the main application. Since the vessel safety depth is not changed dynamically, this operation could be performed once during initial configuration of the system. The input parameter received from main application is safety depth that is defined as vessel draft plus safe under keel clearance. The software receive the safety depth and define NO Go areas for a sailing area (this could be the water area worldwide). Result of the calculation is stored in the server for future use by route calculation algorithms. Based on the start and end point received from the main application, this software returns a number of waypoints providing safe but not the shortest route from A to B. Resulted route can contain unnecessary waypoints and route legs lying within safe water that were added to pass around unsafe No Go areas. The rough route can provide a user quick access to results of the calculation – estimated distance and time to the end waypoint. Upon creation of the rough route, this software can perform the route smoothing calculation. It removes unnecessary waypoints provided that the resulted route lies within safe water. The precise route calculation can be performed right after the rough calculation so user can get quick route immediately and precise route after some time required by this software for calculations. The navigational data received from vessels bridge system as NMEA sentences are sent via web service in real time. The following navigational data are received from Raytheon bridge navigational system NCS ECDIS and transferred via web service: GPS position, Echo sounder (depth), LOG (speed), Wind meter, Gyro (heading). Actual vessel route currently used by bridge system can also be transferred via web service if the route is provided by the Raytheon for output as standard NMEA sentences. 1. The route calculation service does not take into account administrative routing options such as territorial sea limits, prohibited and restricted areas, recommended routes and traffic separation schemes. 2. The bathymetric data model and route calculation service does not consider changes in water level caused by tides and environmental factors such as wind, significant waves and currents. Ocean and sea depth is defined from various water levels which are used on paper charts for soundings and depth contours. 3. The route calculation service does not take into account length, width and height of vessel. The vessel is considered as a material point with safety depth. 4. 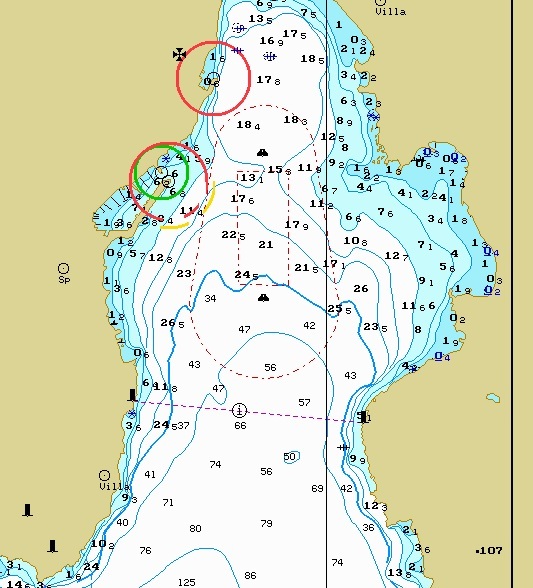 Calculated waypoint positions are referenced to WGS-84 horizontal chart datum if correction to WGS-84 is known from paper and electronic charts. 5. 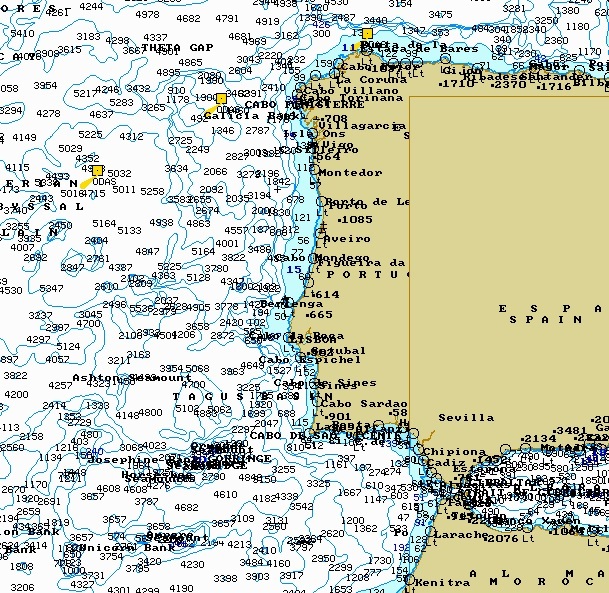 Since land and shoal positions on sea navigational charts used for route calculation can differ from chart display provided by main program (Google or Virtual Earth), it is possible that resulted route crosses land or shoal when displayed in the main program. 6. The route calculation service can work improperly in inland and harbor areas because it does not consider narrow channels and rivers and small port facilities like berths and wharfs. 7. The route calculation service does not work in northern latitudes higher than 80 degrees due to absence of proper bathymetric information in this area. The server running route calculation service should be connected via TCP/IP LAN to a station with the main program and to bridge navigational system.